Line array systems have become the primary loudspeaker configuration for tour sound and many large installations. With the advent of the WideLine WL2082-i Installation Line Array (ILA), QSC offers a professional system at breakthrough pricing making line array performance accessible to a far broader range of house of worship and performance venues. 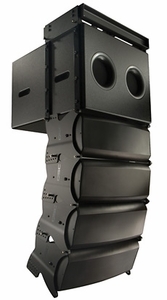 Most line array systems currently available are designed for touring applications. As a result, the overall system cost is driven beyond the means of many facilities that could benefit from line array acoustic performance. By focusing on installation applications, using a molded enclosure and simplifying the rigging design, QSC was able to drive cost out of the system while retaining the sound quality, coverage and power of high end touring systems. Each Installation Line Array element uses a pair of high-power, neodymium magnet, 8" diameter low frequency drivers in a two-and-a-half way configuration. Both woofers produce low frequencies but only one covers the midrange resulting in more uniform directivity in the crossover region. For high frequencies, a pair of 1.75" (voice-coil diameter) neodymium compression drivers with titanium domes are mounted on a patented* multiple aperture diffraction waveguide that provides extremely wide coverage (140�). As a result, a WL2082-i system will rarely require additional side or center fill speakers and solid stereo imaging is preserved across the listening area. The system may be used in bi-amplified or tri-amplified mode. In general, the tri-amplified mode will produce the best performance and, for arrays larger than four boxes, will not increase the total cost of system amplification. The low frequency range of a WL2082-i array will be adequate for speech, voice and many acoustic music uses. For reinforcement of program material with more demanding low frequency content a companion subwoofer, the WL115-sw, is also available. The WL115-sw is a 15" subwoofer using a 4th order, bandpass enclosure. Tooled ports with gently rounded terminations inside and out eliminate port turbulence distortion. Mesh grilles are integrated into the port design to obstruct the entrance of foreign objects into the enclosure. Many users of line array systems have found that suspending the subwoofers with the array provides audible benefits. In addition, some venues lack room for floor mounted subs. For these reasons, the WL115-sw includes rigging hardware and, with selection of the appropriate rigging accessories, subwoofers may be flown at the top of an array or behind as pictured. Rigging for the ILA is simple, flexible and safe providing a 10:1 design factor with twelve WL2082-i systems in the array (see the owner's manual for details before planning any array suspension). The array is assembled with the included bolts and the relative angle between adjacent boxes is adjustable in 1� increments for precise tailoring of vertical coverage. For portable applications an optional kit of four quick release pins is available. Available in black or white, the WL2082-i enclosure is made of high impact polystyrene with extensive internal ribs to eliminate acoustic losses due to sidewall flex. The Installation Line Array may be used in outdoor applications where the system is not directly exposed to the elements. The enclosure material is formulated with UV inhibitors, the grille is made of aluminum and the woofer cones are weather resistant.